The first thing you may ask yourself is how dies a biochar oven work? 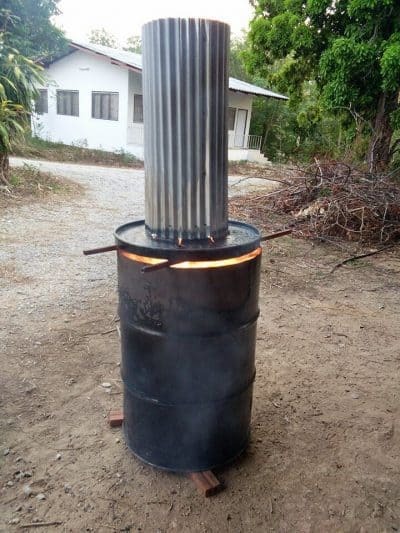 Biochar ovens are based on heating of any organic material (biomass) in the absence of oxygen. Because no oxygen is present the material does not combust but the chemical compounds (i.e. cellulose, hemicellulose and lignin) that make up that material thermally decompose into combustible gases, leaving behind nothing but pure carbon. This carbon equals 40% of the carbon once embodied in the original biomass, making biochar production actually carbon negative. In the heat of biochar ovens, potential greenhouse gases are burned up, as are the particulates that we see as smoke and can cause a range of lung and cardio-vascular diseases. Taking the leap to create your own Backyard Biochar System can at first seem like a daunting task, but rest assured it is easier than it sounds. The many benefits you will reap make it well worth your effort. And the positive impact it contributes to slowing down, and even reversing climate change is priceless. Once you have embraced the concept and are ready to get started here are a few tips and resources to help you along the way. Take a good look at your current biomass disposal process. Differentiate between (1) waste that can be charred easily and (2) waste that is better to compost. The compost material would be the grassy stuff – lawn mower cuttings, weeds from weeding, also leaves if you rake in the fall. It is possible to char, but makes better compost. The material you want to char is the woody stuff – branches, trees, etc. Here you want to do some sorting, too. 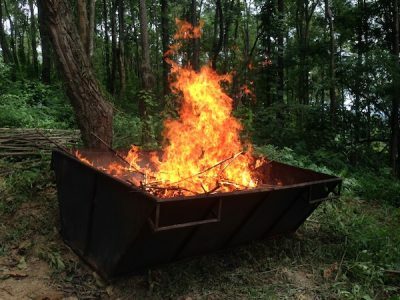 We would not recommend charring the really big stuff – tree trunks, really thick branches. Keep this for the fire place. The stuff to char should probably be less than 4” in diameter. It can go bigger, but if it does, it will take a long time to char and a lot of the smaller stuff will end up burning, losing char. You will need bare dirt for the barrel and/or trough. You will want water for quenching (garden hose is fine). You also need to think about storage. Plan a space for compost and and an area for biochar. Biochar should be kept out of the rain otherwise it will soak up too much water. If you are planning to make serious fertilizer, you may also want too create a shed/covered area for bags of manure next to the biochar. All of this should ideally be located right where you maintain all of your grounds equipment, fertilizer spreaders, etc. How fast do you collect your biomass, daily, weekly, monthly? How often will you put the biochar oven to work will depend on the amount of biomass you are working with. Based on the amount of biomass you are handling you can choose from a variety of Biochar Oven sizes. If you are looking mostly at branches, especially if you don’t want to do a lot of trimming, a trough is the way to go, just chuck it in. Construction is inexpensive and easy. You will find detailed descriptions of available oven designs on our Warm Heart Biochar Oven Specs, decide which one is best for you and simply request a free plan. As for tools, think about how much labor is going to go into preparing stuff for charring. With a trough less preparation is required. What tools will you need, big clippers, a hatchet, and axe, bow saw, chain saw? Determine who will build the biochar oven, yourself, a maintenance crew, gardening crew, will you purchase a pre-made oven, or hire local DIY person? After you have created the biochar, it is time to process it. Before using, you will want to crush the biochar. This should involve no more than putting down several layers of thick construction plastic, putting the biochar on this, and driving a car, truck, or tractor over it. You are aiming for piece sizes running from the size of a kernel of corn down. Nothing will happen to the biochar if left around. Plan a regular schedule to process. When you have accumulated a good amount of biochar process it by mixing the biochar with compost or manure 50:50. Leave it for a week, then put it into the ground (organic fertilizer). If the soil is poor in organic material, mix it biochar:manure:compost in equal amounts. If you are using the biochar primarily to increase water retention, apply it plain or in a mix with compost (better). If you are using it to reduce synthetic fertilizer requirements, you should refer to us. In all cases, (1) you should apply EM to the biochar just prior to putting it in the ground and (2) if you have access to pig pee, cow pee or horse pee, saturate the biochar (it will absorb a huge amount; the absorption properties of the biochar will eliminate any odor) before any use. Combining it with compost to ripen will provide you with excellent fertilizer that will retain water (lowering your water consumption and costs) and build your soil up to a healthy level to help your garden, trees and plants flourish.